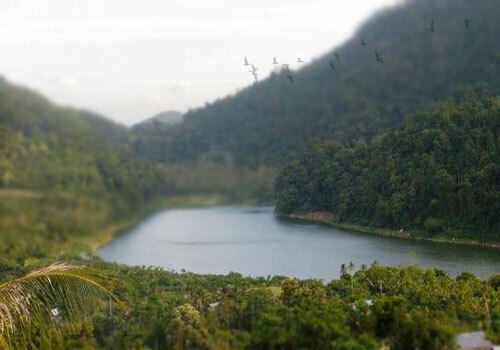 Aneuk laot lake is located in the center of the city of Sabang. Aneuk laot which means the child of the Sea has reaches the area about 30 hectares. Aneuk Laot lake has a beautiful landscape with clear water that can make the visitors feel at peace during their visit. In addition to the clear water with beautiful view, this lake is also have fresh and cool air. The elongated shape of the lake, making it quite unique and feels like a river. Moreover, the green nuance around the lake make the even more dramatic and stunning. This Freshwater Lake is located in the Aneuk laot Village with the distance less than 10 minutes from the center of Sabang, and it can be reached by private vehicle or by public transport. Like any other natural attractions, this object presents an amazing scenery and beautiful sightseeing. If you want to visit during the day, have no worry about the heat of the sun for place is cool and shady. The travelers can enjoy sunset with the view of Sabang ocean. At night time, the scenery is more amazing, when the lake catch the reflection of the lamps from Sabang city. It sparkling beneath the splash of the water. To reach the lake, we can use private vehicles or use public transportation. You can take journey from Kota Sabang for about 30 minutes.